I first found out about the Coffeeneuring challenge in Dec 2013, just as the 3rd edition of the challenge had ended. The challenge, in brief, is to ride (bicycle) to seven coffee-shops on seven weekends in October and November. A couple of other rules exist (the rules have evolved over the year) - at most one ride a day, no more than two trips to the same shop (or chain), rides of minimum 3km, etc. "Coffeeneuring" is a portmanteau of the noun "coffee" and the verb "randonneur". I enjoy both, so this challenge was attractive to me personally. But I think such events are a good way to improve overall bicycle usage. A short ride (esp. when part of a challenge) is a good stepping stone for people who might otherwise have never got around to doing it. Unfortunately this year I have had little success on that count - I didn't really get anyone to ride who weren't already riding. The IISc cycling club (IBN) has had a similar challenge - called the Sunday morning breakfast ride (SMBR) - for a while now, but its an open affair with no deadlines and few rules. 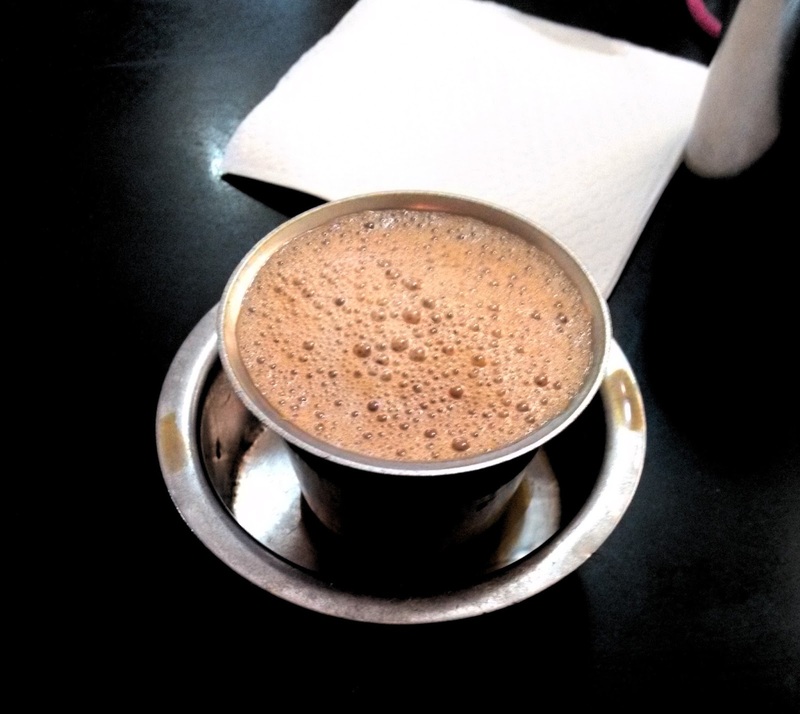 The theme for my Coffeneuring submission is: "South Indian Coffee". I live in the state of Karnataka, which produces over half of India's coffee. In south India, the word "coffee" often refers to coffee (the beverage) served with something to eat. The combination is more commonly known as "tiffin", and includes a food item (Idli, vadas, pongal, dosa etc) with some hot filter coffee (or sometimes tea). For my submission thi year, I visited seven places that serve tiffin, and tasted the finest south indian dishes. Here are the seven short ride reports, along with links to photos. A quiet solo ride to Malleswaram, one of the old localities of Bangalore. Rode down to the HOPCOMS outlet to pick up some fruit, then stopped at Raghavendra stores for some Idli Vada and hot coffee. The place is just a shack next to Malleswaram station, with no seating. People perch on the station parapet or on their two wheelers after collecting their food.Despite the crowds, ordering is quick, as customers organise themselves in a neat queue. In the last ride I covered the eastern half of Malleswaram. This time I covered the western part of Malleswaram. Naveen, from the Institute bicycling club (IBN) joined me for this one, and we rode down to Veena stores for some Khara Bhaath and coffee. Veena stores is another small shop famous for its tiffin menu, and there is always a sizeable crowd. This one had to be a (slightly) quicker ride since Naveen and I both had work later in the day. We rode down to Janatha Hotel in the main market area of Malleswaram for some Masala Dosa and coffee. This is a proper restaurant, built in what was possibly an old house at some point. We rode here for an early breakfast, because the evening rush in the market, especially on weekends, is simply maddening. Nov 1 is Rajyotsava, anniversary of the formation of Karnataka State. Everything is decorated in red and yellow, the colors of the Karnatka flag, and songs in praise of Karnataka and Kannada are played on street corners. Naveen and I decided to do a quick evening ride to Central Tiffin Room (CTR), another icon of Malleswaram, famous for Benne (butter) Dosa. Naveen and I had the time to do a longer ride, so we headed off to south Bangalore. Basavanagudi (literally "bull temple") is quintessentially 'old bangalore' - tree lined roads, single storey independent houses, temples, and old markets. We first headed to Vidyarthi Bhavan for their signature Butter Masala dosa, followed by some Kesari Bhath. On the way back we stopped for coffee at the famous Brahmins coffee bar as well. For this ride I rode to Sagar in Rajaji Nagar. Sagar serves snack items from Western India - mostly Marathi and Gujrati cuisine. The Pav Bhaji and Vada Pav are absolutely sublime. This is one of the few places in Bangalore that serves authentic chaat items and jalebi too. But as I discovered, to my disbelief, they don't serve tea! There is however, a tea stall not too far away on an inner road, where one my have some sweet hot tea. It had been raining since mid-October, but I had managed to finish six rides without getting wet. With one weekend and one ride left, my luck finally ran out. By Sunday afternoon the rain had not stopped, so I decided I had to take the plunge. Rain poncho draped over my head, I rode out in the rain. Due to the drizzle traffic was light, and I was in malleswaram without incident. I realised I had ridden in far worse weather during the brevets, and that riding in rain was actually fun. I finished some errands then headed to Maiya's, by which time the rain had finally stopped. After coffee, I packed the poncho and jacket in the pannier, and rode back before sundown. Unfortunately somewhere along the way my the GPS reset itself, so I don't have the exact distance.